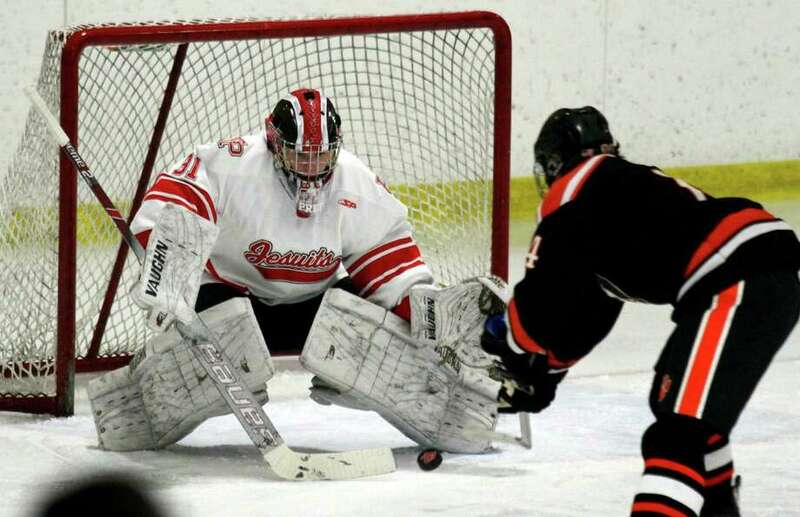 Fairfield Prep goalie Jake Walker deflects a shot by Ridgefield’s Will Forrest during a Dec. 12 game at the Wonderland of Ice in Bridgeport. BRIDGEPORT — At the midway point of the regular season, the Fairfield Prep hockey team finds itself in a relatively usual position — the bottom third of the Division I playoff rankings. Fairfield Prep’s record is 3-6, pending Wednesday’s game with Xavier. The Jesuits position in the standings is a somewhat of a red herring. For one, there are fewer than 16 teams playing Division I this season meaning all teams should qualify, save for NFI which opted out. More importantly Prep has played its traditionally challenging non-league schedule, meaning coach Matt Sather isn’t too hung up on his team’s record. The loss to the Blue Wave continued a concerning trend for the Jesuits, the defending Division I champions. Prep fell to 1-4 in one-goal games and is 0-3 in overtime. Prep completed is bye week earlier this month, so the rest of its season falls into a more-consistent Wednesday/Saturday pattern, akin to the postseason. It also means enough time has elapsed that the current Jesuits can distance themselves from last year’s squad that graduated 13 players and earned the No. 1 seed in Division I.
Sather pointed to the reliable play of senior goalie Jake Walker as something the Jesuits can build around. Sophomore Mason Whitney has stepped up into a more-prominent role within the offense, while senior Peter DiDomenico’s made a seamless transition from forward to defense. With 17 CIAC state titles to their name, few programs across any sport in Connecticut have the tradition of Fairfield Prep hockey. The Jesuits always get the best effort from the opponents and that was part of the reason Blue Wave players and traveling fans celebrated their overtime victory so wildly. By the same token, when the Division I state tournament rolls around whatever seed Prep ends up earning will mostly be irrelevant. The name-value and history of Prep continues to carry weight and knocking the Jesuits out of the playoffs won’t come easy.